Searching for a home within the Conway Elementary School Zone? Then you are in the right place! We work hard to make your next home search easy and efficient, so that when you are ready to buy or sell, we are ready to help! 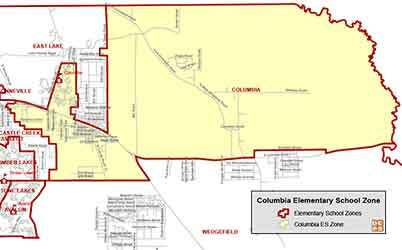 Students of Conway Elementary reside within the 32806, 32812 and 32822 zip codes. Conway Elementary School has a history rooted deep in our community. The present school campus located at 4100 Lake Margaret Drive opened in 1954. This original building had sixteen classrooms. Additional wings were added in 1958 and 1960 to accommodate rapid growth in the area and served students in the Conway community for 54 years. On January 2, 2008 a brand new building opened on the school site, including 38 state of the art classrooms, to expand the possibilities for our students in the rapidly changing, technology driven world. The first principal of Conway Elementary was Mamie Fugate. She is viewed as the matriarch of the modern school and a plaque that honors her contributions is mounted near the entrance of the school building. Other principals that followed in succession include Franklin Carver, Bill McDaniels, William Bailey, Jim Kiser, Charlotte Barolett, Leanna Isaacson, and Karen Babb. The current principal, Sean Maguire, was appointed in 2014. Teachers in one room county schools were paid $30 a month. The original school grew to have five rooms and a lunchroom until 1954, which is when Conway Elementary School was built and the middle grades eventually became Conway Middle School, after construction in 1969. After School Programs: Dramatic Education, Inc.